The creator of Animal House at last tells the real story of the fraternity that inspired the iconic film-a story far more outrageous (and funny!) than any movie could ever capture. 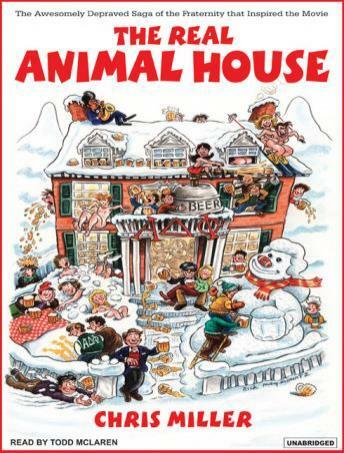 Animal House, the film adaptation of stories Chris Miller published in National Lampoon about his experiences at a Dartmouth fraternity, is among the most beloved and successful comedies of all time. In fact, its portrayal of college party life is still imitated on campuses across the country-toga party, anyone? Now, nearly 30 years after the movie hit theaters, there are no taboos left, and Chris Miller can finally answer the fans who all want to know one thing: Was it really like that? The answer: Yes-but much, much more out of control! Here, for the first time, are the real stories of Alpha Delta Phi. Like the one about the frat brother who entertained the house by lighting his hair on fire-not the hair on his head, however. Or about the pledge who trick-or-treated around campus in a very revealing jack-o-lantern costume. Or about initiation night when a frozen hot dog became very painful for two rushes. Wild and hilarious, The Real Animal House is a must-read for any fan of the film and anyone who remembers their college days as a blur of great parties and solid friendship.